With just 15 months left on his sentence, Arnold Nash escaped last week only to be caught four days later, in an apparent effort to stay longer in the captivity he's known for so long. It all sounds so redemptive. “The Division of Correctional Programming and Services is committed to serving the State of Maine by ensuring offenders – from the recently incarcerated to the long-term committed – leave our facilities with the skills, treatment, and education needed to succeed after their period of incarceration,” reads the introduction to the “Best Practices” link on the Maine Department of Corrections website. For most, if not all, of the 1,300 or so men and women released from the state’s custody each year, all that pre-release preparation spells a chance to hit the reset button, to leave the sordid past behind, to bask, however momentarily, in a ray of hope. Or, in the case of Arnold Nash, to head for the hills. Much of Maine quaked last week at the news that Nash, 65, had escaped – actually, walked away – from the Mountain View Correctional Facility in Charleston with a mere 15 months left on his sentence for committing murder and robbery way back in 1992. “Nash is considered dangerous and should not be approached if spotted,” warned one of several news releases put out by the state before he was captured early Tuesday morning. Dramatic it wasn’t. A sheriff’s deputy apprehended Nash without incident as the escapee trudged, weary and bedraggled, along Route 15 in Dover-Foxcroft not far from the minimum-security prison. It was also the best possible outcome for Nash. It appears his only motive for escaping was to get caught and thus spend more time behind bars. Most people go to prison and, from the moment the cell door swings shut, start counting the days to their release. Not so for a guy like Nash. His rap sheet goes all the way back to when he was a teenager in the early 1970s. 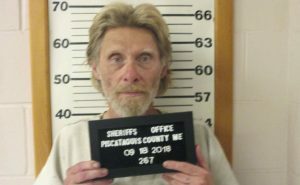 He’s escaped from prison twice before – once in 1973 and again in 1981, when he and another Maine State Prison inmate spent 22 days on the lam in what would forever be known as the Moody Mountain Manhunt in and around the central Maine town of Morrill. After his 1992 conviction for robbing and beating to death his 58-year-old neighbor in Hancock County, Nash settled into his 45-year sentence without any serious trouble. Good behavior shaved 18 years off his sentence and, to prepare him for his scheduled re-entry to society in December of 2019, Nash went from the Maine State Prison in Warren to the now-closed Downeast Correctional Center in Machiasport and, more recently, to fence-free Mountain View in Charleston. There, sometime last Thursday evening, he took a hike. The longer the ensuing manhunt lasted, the more accusing fingers pointed at the Department of Corrections. What, many asked, were corrections officials thinking? Why would the state put a killer like Nash in a low-security environment like Mountain View in the first place? Because like it or not, any sentence short of life imprisonment has an end date, that’s why. And the more we do to prepare long-term inmates for that fateful day, the less likely they are to cause trouble once they’re plunked back into a strange new world of smartphones, internet surfing and satellite-linked cars that actually know how to get there from here. What the current system can’t handle, however, is that occasional inmate who prefers the “three hots and a cot” behind bars to the bewildering world outside the barbed wire. Someone who will gladly commit another crime – escape, a Class C offense in Maine, is punishable by up to five years – if it means not having to catch up with a society that kept right on moving even as his life stood still. Paroled after 50 years, Brooks grapples with a job in a Food-Way grocery store and the claustrophobia of a halfway house until, unable to stand his freedom, he hangs himself from the ceiling in his bedroom. It was hard not to feel sorry for the fictional Brooks, played by the ever likable James Whitmore. The real-life Nash evokes no such sympathy. His walk in the woods over, Nash now finds himself back behind higher walls for the foreseeable future. And perhaps much to his relief, the years ahead will look just like the years past – complimentary meals, health care when he needs it and rent-free shelter from the windy, rainy and often-cold world outside. If only we could send him a bill.